Welcome to The Music Stand. We invite you to take one—a stand, that is—and take one with us. The more we see of the world and the souls that make it up, the more we see how universal the need for beauty is. In the Prayer Before the Ambo at the end of every Divine Liturgy, an Orthodox priest prays “Sanctify those who love the beauty of thy house.” How do we love something? By serving it, by giving ourselves to it, by sustaining it and cherishing it. The beauty of all the liturgical arts in a church is quite literally a manifestation of our love for God’s house—and thus, our love for Him who abides in it. But singing beautifully in church above all manifests that love now, in real time. The great thing, though, is that this is a path to sanctity. God sanctifies us through our actively loving the beauty of His house. And not just us, but lots of people. Everyone who walks into a church where this is happening will be affected on a deep level. This is the kind of beauty that saves the world, as Dostoevsky said. God knows we need it. Benedict was raised in the Orthodox Church by parents who converted when he was very young. He always enjoyed music, but it wasn’t until his secular humanist grandmother sent him a cassette of Russian Orthodox music for Christmas when he was thirteen that he really fell in love with church music. That tape changed his life. He had never really done music seriously before, but from that point on he plunged headlong into musical studies. Leaving high school to be homeschooled, he took music theory and history classes at Dartmouth College where his father taught, started taking piano and voice lessons, and involved himself in practically every musical happening in his area. 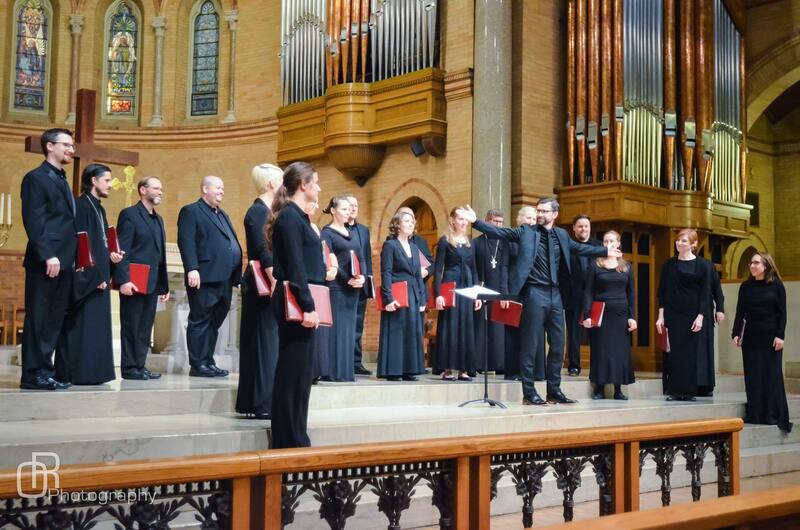 He also began directing the choir at his local Orthodox parish in New Hampshire. Maria was born in the Bahamas, her father’s homeland. When she was a toddler, she and her parents moved to Pennsylvania to her mother’s family’s home. She was trained in the robust music program at her public school as well as at the sophisticated church music program at her family’s Presbyterian church. The music of her childhood ranged from Calypso to Tudor anthems, from Nirvana to Chopin, from Led Zeppelin to Mozart. She sang as a soloist, and in jazz choirs, symphonic choirs, children’s choirs, adult choirs, in operas, in musicals, and in rock bands. She played the piano in rock bands and jazz bands, as an accompanist and a classical soloist. They each decided as kids that no matter what their adult life might look like, music was going to have to be at the center. And more than that, they both felt that choral music was the most powerful and inspiring musical experience that they each had had. And so, naturally, they both went to Westminster Choir College in Princeton, New Jersey—the only four-year conservatory in the world focused principally on choral music—where they met in 1997. There Benedict majored in Theory and Composition, Maria majored in Music Education, and together they enjoyed the distinction of being voted “Most Likely To Be Married Before Graduation”– because by then they already were! 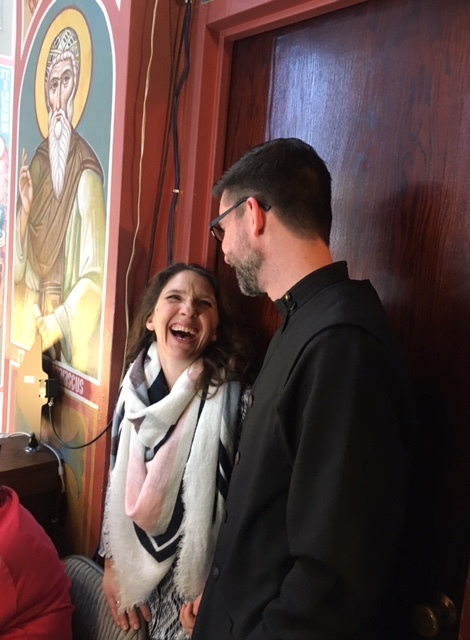 Many twists and turns of life have brought them to where they are today, at St. Tikhon’s Monastery and Seminary, in Pennsylvania, where they live, cozily, at the top of a hill with their seven daughters. 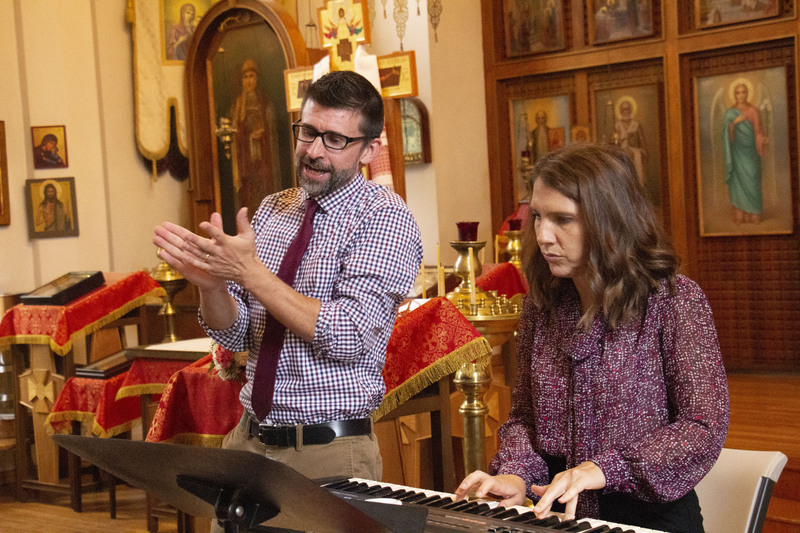 At St. Tikhon’s, Benedict is Director of Music for both the Seminary and the Monastery, overseeing services, music classes, ensembles, and publications. Maria teaches voice, music theory and church music at the Seminary, and directs a women’s choir and a children’s choir. In 2015, together with the Monastery’s Abbot Sergius, the Sheehans founded the Saint Tikhon Choir (formerly known as the Chamber Choir of St. Tikhon’s Monastery), a professional vocal ensemble dedicated to the fostering and building up of an American Orthodox choral tradition. They are also co-founders of the PaTRAM Institute, an organization that helps educate church musicians in America. PaTRAM’s male choir, under the direction of Russian conductor Vladimir Gorbik, was nominated for a Grammy® in the “Best Choral Performance” category in 2018. Also in 2018, a brainchild of Benedict and New York conductor Steven Fox was born at the Washington National Cathedral in the form of a world-premiere performance of Alexander Kastalsky’s long-forgotten Requiem for Fallen Brothers (1917), a monumental choral/orchestral work commemorating the Allied slain of the First World War. The performance was a massive collaboration between some of America’s leading ensembles, and was named one of the Top Ten Performances of 2018 by the Washington Classical Review. Benedict also regularly guest conducts Cappella Romana, an acclaimed vocal ensemble based in Portland, Oregon, and is credited as Associate Conductor on the Clarion Choir’s Grammy®-nominated 2018 release, “Kastalsky: Memory Eternal.” In 2019 the Sheehans will be premiering and recording Benedict’s newly-composed Liturgy of St. John Chrysostom, commissioned by the PaTRAM Institute, with the Saint Tikhon Choir. Another of Benedict’s pieces, a score based on the traditional fairy tales Snow White and The Little Mermaid, will be performed and recorded by the Grammy®-nominated Skylark Vocal Ensemble in 2019. Benedict’s music is available from MusicSpoke and Musica Russica. 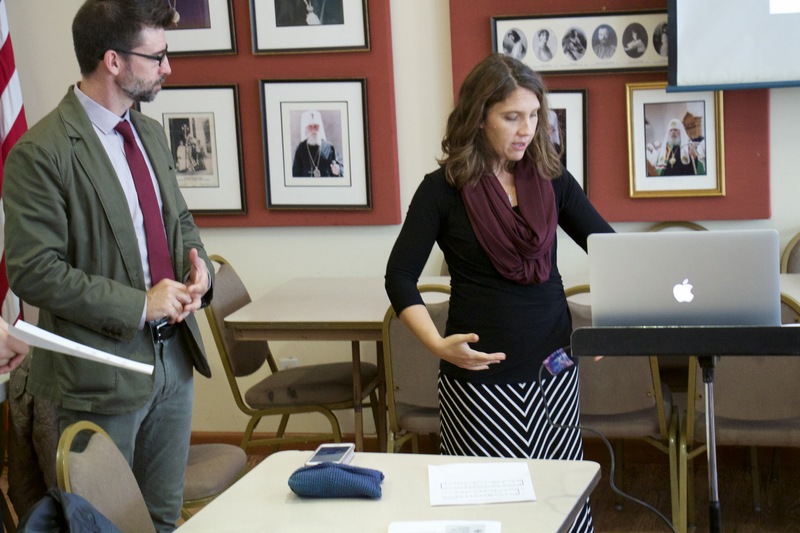 The Sheehans travel around the country as a team—about once a month, in fact—presenting workshops on church music to parishes and regional gatherings of musicians. You can read about and book one of their workshops at benedictsheehanmusic.com/workshops. They also love bonfires, getting to know their kids, artisan cheese, folk music, forest bathing (it’s a thing, look it up), contra dancing, Netflix, lake swimming, carpentry, reading aloud, great design, whiskey, cities, minimalism (ironically), dinner parties, gardens, bespoke clothing, antique rugs, Handel, their weekly brunch date, regional dialects, baseball, and finding out that basically every new person they meet is totally amazing. Though not necessarily in that order. Welcome to The Music Stand. 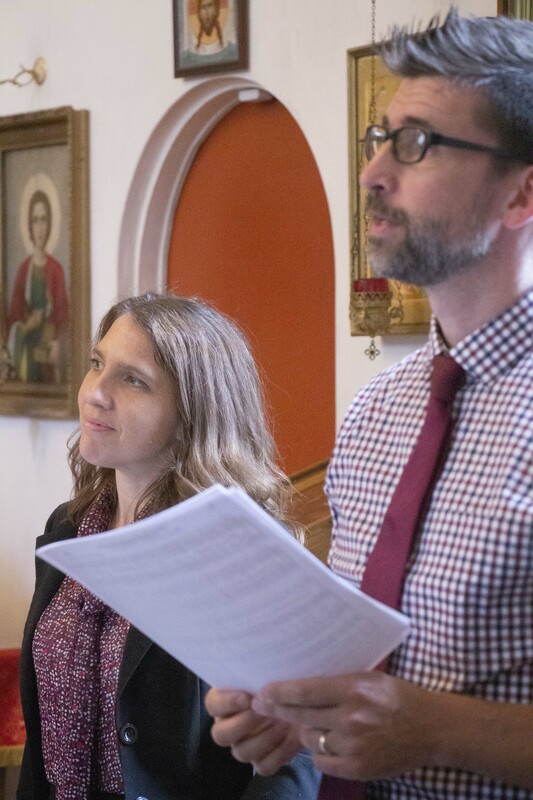 We’re the husband and wife musician team of Benedict & Maria Sheehan, and this is our blog about church music, culture, education, liturgy, and the challenges of beautifying God’s house in today’s world. Have you ever felt that thrill of joy that sends waves of chills from your head to your toes (and often forces tears from your eyes) when you were surrounded by something truly beautiful, something deeply moving? Whether it was something you helped to create or something you were merely blessed to be present for, it’s that same experience—and how to share it with a world that badly needs it—that (literally) gets us up in the morning.